Michael Hegarty was arrested in Belgium following an international arrest warrant. The man has been jailed for 18 months. 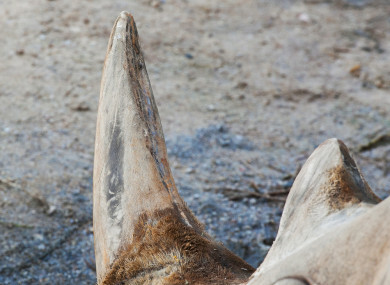 AN IRISH MAN who was connected to US smuggling syndicate ‘the Rathkeale Rovers’ has been sentenced to 18 months in prison for trafficking a rhino horn. Michael Hegarty was handed the prison sentence in a court in Miami, Florida and he will also be subjected to three years of supervised release after he leaves prison. The rhino horn had been carved into the shape of an elaborate drinking vessel, described in court documents as a libation cup. In May 2014, Hegarty was indicted with charges of conspiring to traffic a libation cup made from an endangered rhinoceros. He was also charged with attempting to smuggle the rhino horn from the US to the UK. The US Department of Justice said that Hegarty and co-defendant Richard Sheridan purchased the libation cup from an auction house in North Carolina. They then transported the cup to Florida and falsified documentation to smuggle the cup from the United States. Hegarty was caught in January of this year in Belgium after US authorities issued an international arrest warrant through Interpol. Ed Grace of the US Fish and Wildlife Service says the imprisonment of Hegarty is “a message” to would-be smugglers. “Today’s sentencing sends a message to those who profit from the slaughter and illicit trade of wildlife, you will be caught and prosecuted no matter where you hide,” Grace said. “I commend our special agents who connected this defendant to the Rathkeale Rovers, a transnational organised crime syndicate responsible for trafficking endangered rhinoceros products worldwide,” he added. The conviction came as part of Operation Crash, an enforcement operation in the US designed to crack down on the sale and trafficking of rhino horn. Email “Irish man from 'Rathkeale Rovers' smuggling gang jailed in Miami for trafficking a rhino horn ”. Feedback on “Irish man from 'Rathkeale Rovers' smuggling gang jailed in Miami for trafficking a rhino horn ”.